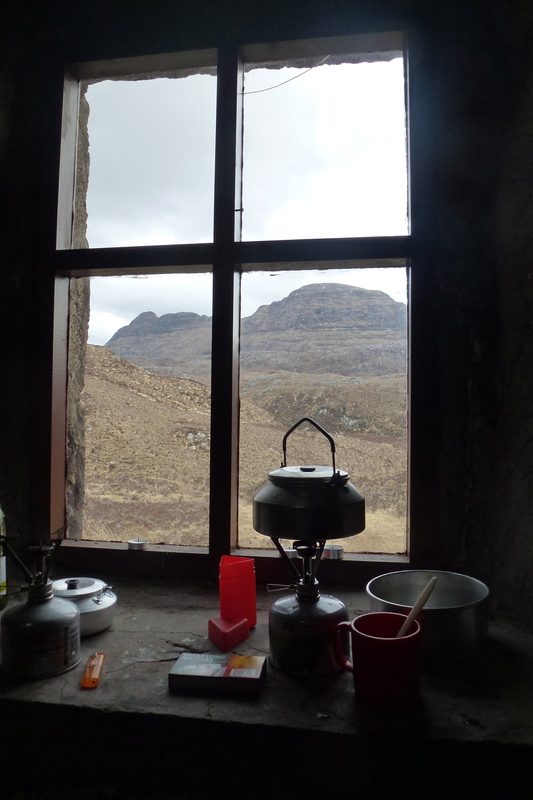 The Inchnadamph Hotel is host these days to walkers, fishermen and tourists but in the 1880s two men stayed here overnight and their work in the Assynt area was to change the understanding of the earth’s internal structure for ever. 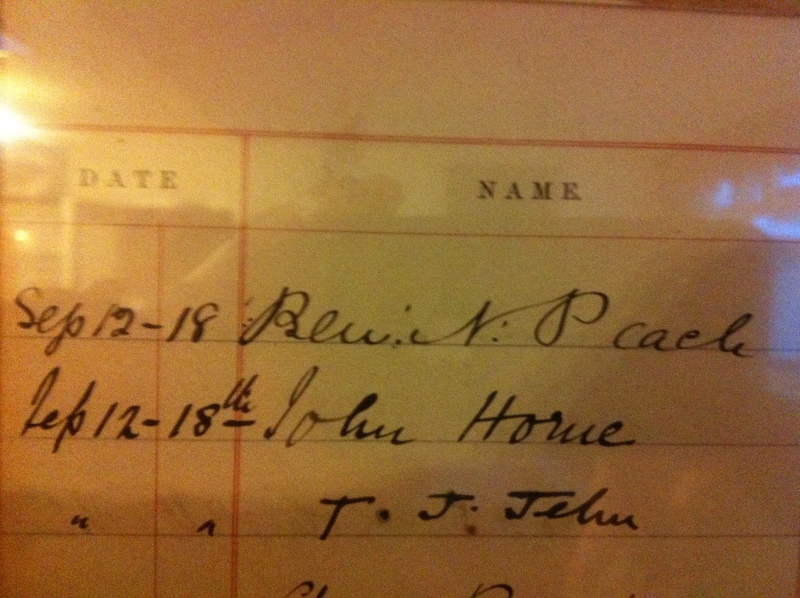 They were the celebrated nineteenth century geologists Ben Peach and John Horne whose signatures in the visitors book are proudly displayed in the hotel. Such is the importance of the ancient rocks in these hills the area will always be a magnet for geologists. There were a few in the bar in the evening but breakfast was shared with other walkers and fishermen who were, like us, excited about their plans for the day. 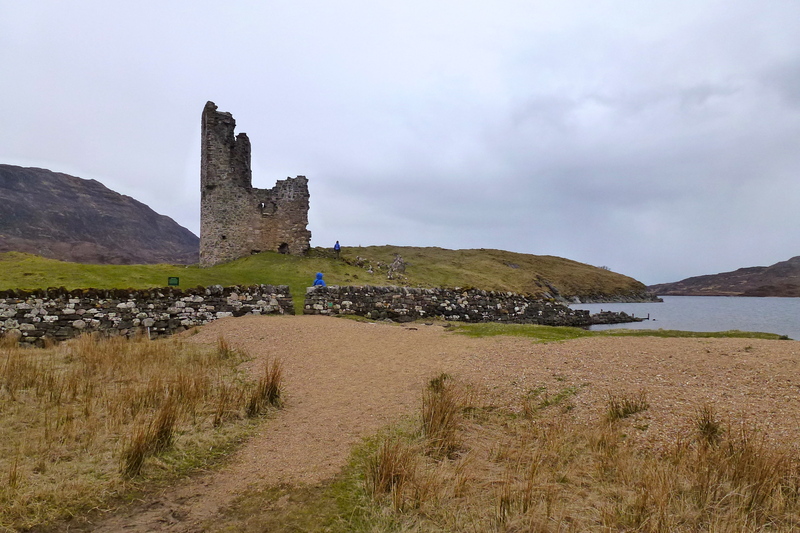 We daundered up the road, stopping to look round Assynt Church and its graves, poking about the MacKenzie stronghold of Calda House then out to the stark ruins of Ardvreck Castle, the 15th century seat of the MacLeods of Assynt. Finally we tore ourselves away from the crumbling walls and set out across the old Marble Road over the hill towards Unapool and Kylesku, a route that was used to transport marble quarried nearby in the early 1800s. Our alternative route delving deeper inland to a waterfall looked wild and magnificent on the map but the rain had started and we knew we would see little of the scenery in such conditions. 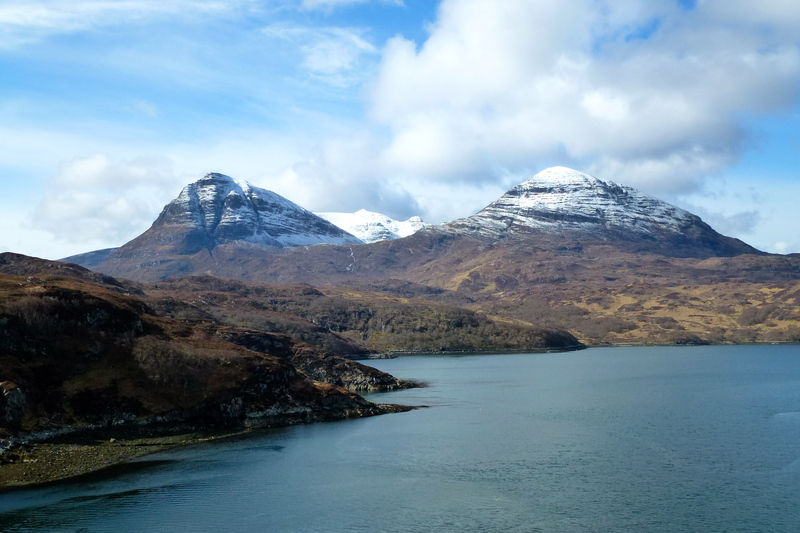 Our constant companion now, dominating the views to the west, was the multi-topped topsy-turvy mountain of Quinag with its fresh snow covering. Then, as we walked along the main road, our focus changed to Loch Glencoul and the famous “Glencoul Thrust” on the hillside across the loch. It’s a stunning example of “young” 540 million year old quartzite sandwiched between two layers of Lewisian gneiss which is 3000 million years old. I quote the figures we read on the info board but struggle to understand the forces that shuffled the rocks below the ground to create such a feature and have no comprehension whatsoever of what 3000 million years (or even a million years) might look like! But it’s still awesome information so I stared across at the rock for a long time trying to imagine the excitement of Peach and Horne as they made their discovery then their struggle to change established opinion. Younger rocks below older ones? No wonder Assynt has played host to international geologists ever since. We were drenched when we reached our B&B late in the afternoon but soon ready to venture back out into the night for the mile-long walk to the Kylesku Hotel’s restaurant for some delicious fish and chips. And then it was back on with the boots, waterproof jackets, leggings, hoods and out into the pouring rain, up the road to bed. If only I had been able to lift my eyes from my feet I’d have spent the whole long day gazing at views of Suilven and Canisp. 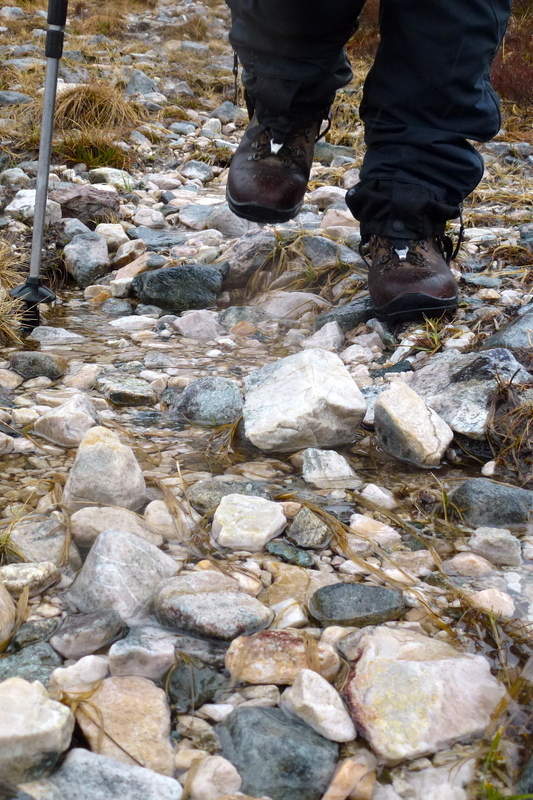 But the track was rough, boggy, difficult to find and often masquerading as a river-course after the previous 12 hours of heavy rain so every step had to be carefully negotiated. That meant I had to stop a lot, to stand and stare at the silhouettes of the hills which changed so starkly from every angle. 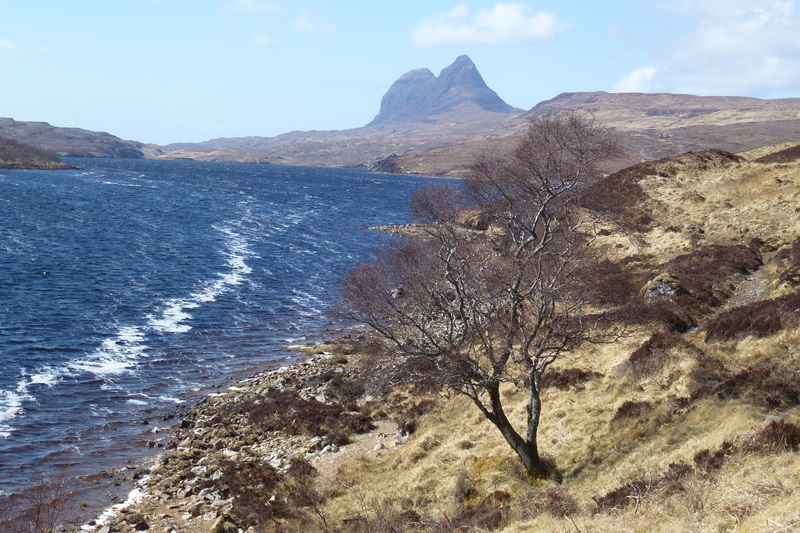 On our walk in to Suilven, Caisteal Liath, the true peak, dominated the horizon. And while it is just 8 metres higher than Meall Meadhonach, it reared magnificently. Now though the “pointed” end appeared to soar stark and elegantly beautiful above its dumpier twin. Meanwhile sleeker, elongated Canisp became our neighbour. Its extra 100 metres of height had attracted a fresh covering of snow overnight and we walked the whole length of its long southern flank past more than a dozen streams tumbling down the hill, all overflowing with water. 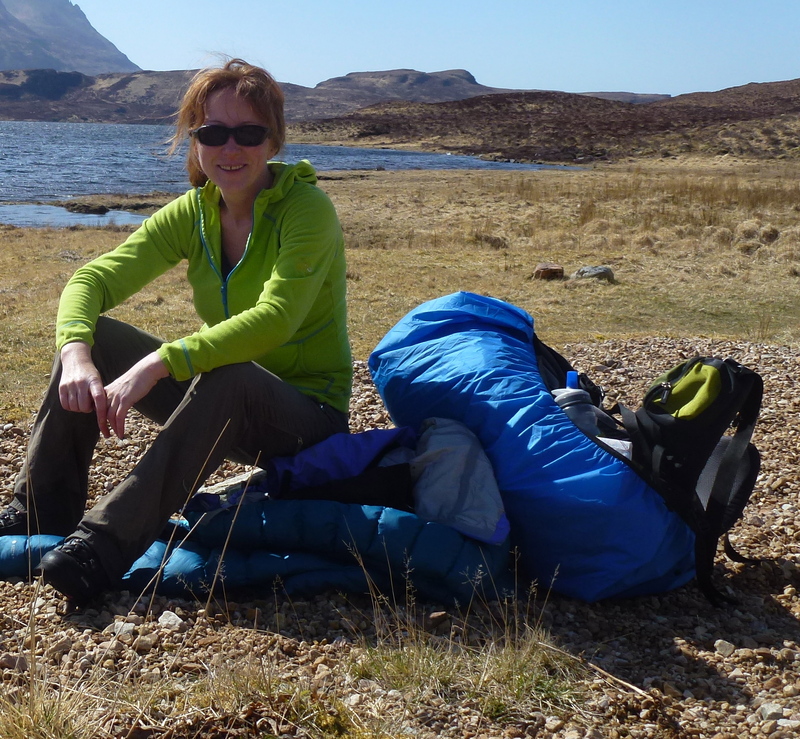 Finally we stopped for a rest and lunch near the end of Lochan Fada, the long narrow loch. We found a spot that was down near the river and as sheltered as could be but it was windy so we struggled to light a stove. 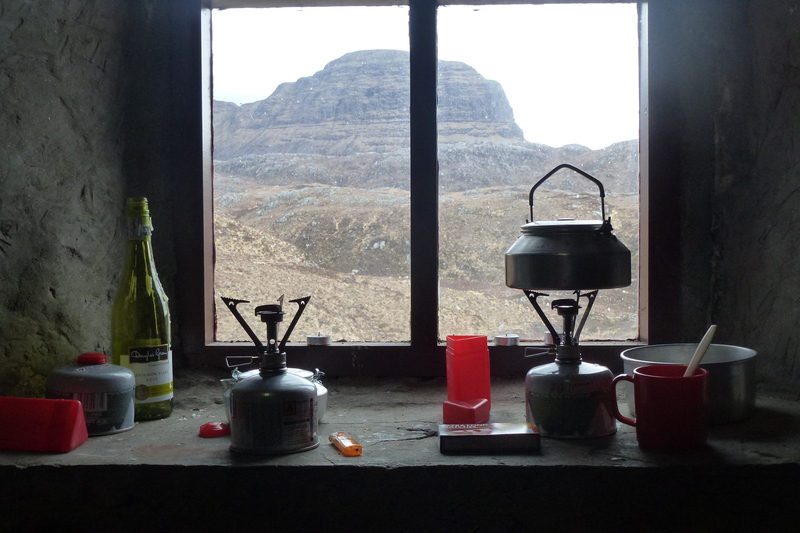 Finally though the water boiled and we had sustenance: soup, hot chocolate and Alpen bars. The recommended route from here was to cut across country, over the shoulder of Canisp to hit the main A837 road and walk towards Inchnadamph but we figured the much longer “track” would be better when the ground was so boggy. Hmmm. I doubt if the open hillside could have been any worse than the route we chose, which was often a real struggle to locate at all. 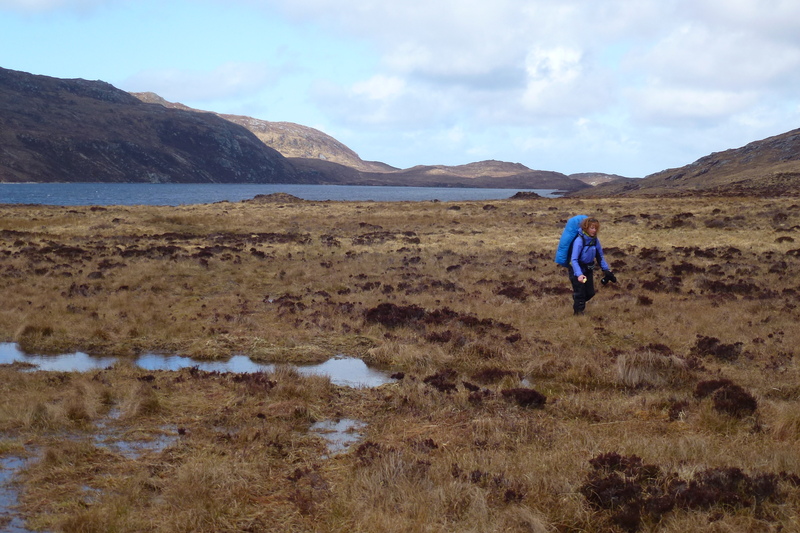 We ploutered on and eventually (with some imaginative orienteering) reached the shore of the rugged Cam Loch which would have made a fantastic camping spot. 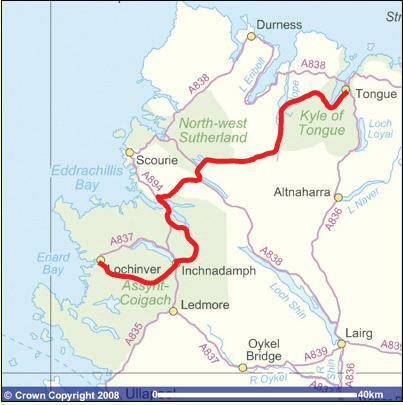 But time was short so we headed on, hugging the shore, and finally made it out over an awful last section, through a gate and on the road between Elphin and Ledmore. Inchnadamph was still a 6-7 mile walk from here along the main road and we were getting weary after two heavy days. A car sped past ignoring my outstretched arm. And then – oh the excitement! – a school bus pulled up. The kids looked aghast and held their noses as we heaved our wet packs aboard and sank down in seats near the front. Assynt sped by from the window, Canisp passed in a flash and quickly, effortlessly we were deposited outside the Inchnadamph Hotel. Yes, of course the plan had been to camp, but we were drenched and bodies and feet were aching. The prospect of soaking in a bath of hot bubbles was just too enticing. Richard at the hotel was great. He collected our sodden boots and clothes in baskets outside our rooms and had them clean and dry for us in the morning. He also provided sound advice, the best weather forecasts and the use of his laptop during the course of the evening as we lounged at an open fire over a couple of drams and some good hot food. Tomorrow would be wet, windy and cold but I couldn’t wait to get back on the trail in the morning. Back in the bothy we were shivering. The air was damp and our bags had been too heavy to carry fuel for the fireplace. Yet our timing had been only slightly out as I’d met people on the hill who’d had a great roaring coal fire and company the previous evening. But we were alone with only matches and a few kindlers to burn. It was barely enough. We boiled water, made soup and pasta then at 8pm, wearing every piece of warm clothing in our rucksacks, we crawled into sleeping bags to drink hot chocolate. It was bedtime in the bothy. Just before midnight I woke up. A full howling storm was battering our tiny stone house, torrents of rain pelting down on the noisy metal roof and rattling windows which looked out to the dark hulk of mountain. I lay and listened, absorbing the full might of the weather and idly pondering (as you do through the night) how the modern roof was attached to the ancient walls and just how secure it might be. Occasionally there would be a respite and then the wind whirled around us, sucking up enough energy to batter and blast with wave after relentless wave of fury. Rain soaked in under the shaking doorway and somewhere at the far end of the bothy another door banged all through the night. How fortunate that we had retraced our steps and not camped as originally planned. It would mean an extra few kilometres walking in the morning but for now we were safe and dry. And finally warm.